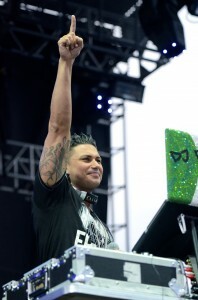 DJ Pauly D of “Jersey Shore” fame is scheduled to light up the stage at Southern Arkansas University’s sixth annual free spring concert on Thursday, April 10, 2014. The outdoor concert will take place at the SAU track, located at the intersection of U.S. 82 and Jackson Street in Magnolia. Gates will open at 7:30 p.m., the opening act will be at 8:30 p.m., and Pauly D will take the stage at 9:15 p.m.
Paul “DJ Pauly D” DelVecchio is recognized for his musical talent as well as his reality star status on MTV’s highest rated show, “Jersey Shore,” which premiered in December 2009. He has made a name for himself on 50-Cent’s record label G-Unit Records by mixing such singles as “Beat Dat Beat” and “Back to Love” featuring Jay Sean. He mixes in and out of his music library that spans nearly every genre of club music. Opening for DJ Pauly D will be Chicago native Jack Novak. Novak is a Producer/Songwriter/DJ who has electrified audiences throughout North and South America. The honesty of her music and her enthusiastic drive have earned her the distinction of being voted one of the “Top DJs to Watch of 2014” in Vibe Magazine. The spring concert series at SAU began during the University’s 2009 centennial celebration. Previous performers have included former SAU student and country music star Tracy Lawrence, Eric Hutchison, Sean Kingston, Thompson Square and pop duo Karmin. For more information on the concert, contact the Office of Student Activities at (870) 235-4925.